The CHARGIN 2 Stripe kit is in stock! If you have been searching for the best 2006 2007 2008 2009 2010 Dodge Charger Daytona Decals, then you came to the right place, because Fast Car Decals have the best deal around for 2006 Dodge Charger SXT Decals. 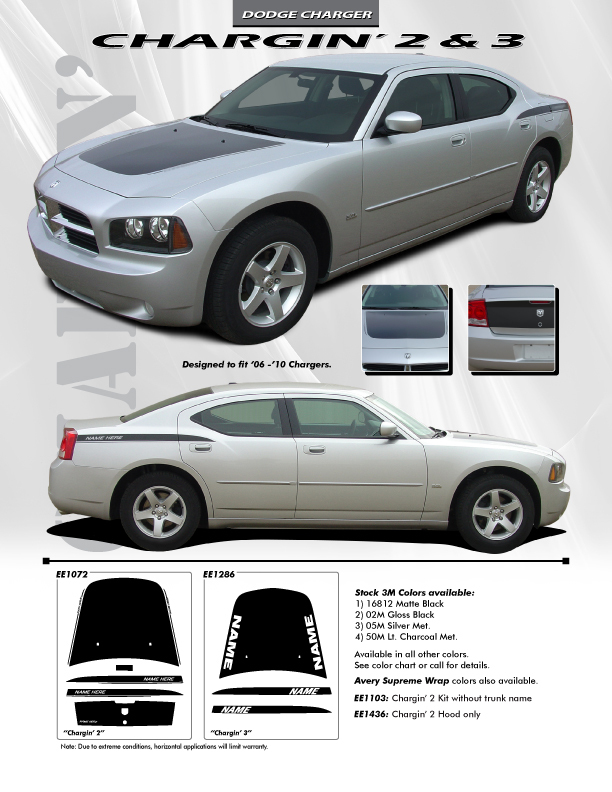 Upgrade today with 2006 Dodge Charger RT decals from FCD. FastCarDecals.com is the number one website for high quality Dodge Charger body stripes at the lowest prices. We have been supplying car owners with the best Dodge Charger vinyl graphics since 1983 and auto enthusiasts all around the country trust Fast Car Decals to produce the best Dodge Charger racing stripes for their cars. FastCarDecals.com TEXT or Call Us Today!